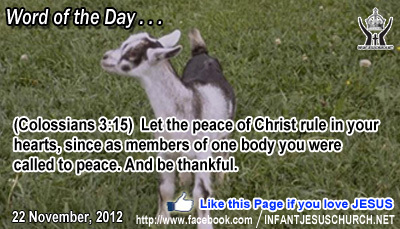 Colossians 3:15: Let the peace of Christ rule in your hearts, since as members of one body you were called to peace. And be thankful. Heavenly Father, please give us a heart to love your people. We know the nature of Jesus permeates our life, we will appreciate the preciousness of each of your children more and will come to see those difficult family members as the grit out of which you will fashion our pearl. We pray you give us grace till our heart matches our commitment to love all of your children. In the name of Infant Jesus we pray. Amen. 41And when he drew near and saw the city he wept over it, 42saying, "Would that even today you knew the things that make for peace! But now they are hid from your eyes. 43For the days shall come upon you, when your enemies will cast up a bank about you and surround you, and hem you in on every side, 44and dash you to the ground, you and your children within you, and they will not leave one stone upon another in you; because you did not know the time of your visitation." When God visits his people he comes to ascertain peace and justice by rooting out our enemies sin and Satan who enslave us to fear and pride, revolt and hatred, envy and covetousness, strife and violence, and every shape of evil. That is why God both judges and purifies his people - to lead us from our wicked ways to his way of justice, peace, love, and sanctity. God actively works among his people to educate us his ways and to save us from the demolition of sin and Satan. Are God's judgments unjust or unloving? Scripture tells us that "when God's judgments are exposed in the earth, the inhabitants of the world learn righteousness". To say judgment on sin is much less harsh than what will happen if those who sin are not warned to regret The Lord in his compassion gives us grace and time to turn away from sin, but that time is right now. If we delay, even for a moment, we may determine that grace has passed us by and our time is up. Do we accept the grace to turn away from sin and to walk in God's way of harmony and holiness? Loving Infant Jesus, you have visited and redeemed your people. May we not miss the grace of your visitation today as you move to bring your people into greater righteousness and holiness of life. Purify our heart and mind that we may understand your ways and conform our life more fully to your will.